This was the view on Sunday when I came into the church building. What a beautiful sight to begin another wonderful morning with Covenant Life Church. Judah Groveman and Zelos led us in singing, and Robin Boisvert taught us on Christian citizenship in a message called "Don't Waste Your Vote." Listen here if you haven't yet or if you were under headset in camera land. Thanks to everyone who has been faithfully reading, learning from, and completing the checklists we introduced back in the springtime. If you look at recent Reverb posts, you'll notice fewer probems and issues, and I think that is partially because the checklists are helping us remember what to do and are assuring we get everything done. I did notice, however, while going over the checklists from Sunday (yes, I do see them all each week) that there were several empty checklists. Some were for positions where people didn't come in to serve. Some were for positions that people actually filled. If you served and yet didn't complete your checklist, you will be hearing from me sometime this week. The danger with checklists is that by their very use they become critical. I need you to fill them out, no exceptions. And for the checklists that would have been covered by absentees, I have some basic direction: ultimately the person directly above them in the org chart is responsible for their tasks. Who may that be, you ask? Check out the org chart for the auditorium production teams here. This means the camera director should take responsibility for a missing camera op. The audio producer should take responsibility for a missing stage tech. The executive producer takes responsibility for a missing lighting operator. With several blank checklists, I'm surprised we had almost no problems all morning. Praise God! I'm pretty sure this means that people did appropriately take responsibility for each other. However, please do take the moment to use the checklists and fill them out. They will help you and they will help me later. Thanks! Zelos is a younger band with a more modern sound than our normal Sunday worship team. Personally, I appreciate the more modern arrangements and I also like the changes in sound from week to week. Do you? However, Jim asked me an excellent question as he was working on the mix: Because this is a younger band with a more modern sound, should it be louder? We should still be aiming to hit our normal sound pressure levels, around 95-98 dBC. Please don't push it just because it is a more modern-sounding band. However, there will likely be a sense in which it will seem louder to some. I was absolutely confident that Jim stayed within reasonable limits on Sunday, but we still got one complaint about it being too loud. I suspect that is because not everyone differentiates between style and volume. Sometimes a more solid kick/bass foundation can equate to "louder." Sometimes more electric guitar can seem louder, too. In this sense, I do want it to be "louder," if that is what the band's arrangement calls for. As sound mixers, we should be seeking to replicate the musical style that the band is producing, not necessarily the "normal" Covenant Life sound (whatever that may be) or even our preferred styles. Thanks, Jim, for doing this very well last Sunday. One quick staging note for the sound crew: Whenever possible, musicians should take their instruments with them when they are done playing. I was so happy that all three guitars ended up in the green room after the 1st service singing concluded. But that left two things on stage: one drum set and one lonely, fragile violin in the middle of the floor. While the musician's are ultimately responsibile for the care of their instruments, the sound crew can serve by reminding people to take their stuff with them. Lighting was very smooth this weekend. Phil had everything aimed and programmed in a couple hours and everything ran as planned during the services. Thanks, my man! Video, too, was very smooth. The slides went great. Robbie, Dennis, and Sylvia worked out their own plan for side screen slides. What was that, folks? We could all learn from how you did it. Baptisms went well, especially considering that we had no camera 5 operator. It would be wise for all video folks to review the preset shot order for baptisms here. One question came up from our house director about when to go to blank logo between baptisms. To clarify, blanking the screens is not a modesty issue if the final shot from camera 1 is wide enough to prevent immodesty. Blanking the screens is primarily to avoid the awkardness of people getting into and out of the pool. That means that there can be a pause between seeing the wide shot on camera 1 and the screens going blank. Don't wait too long, but definitely avoid the "stacked dissolve" where the camera director dissolves to camera 1 and then the house director immediately dissolves away to blank. This was an exciting week and weekend at Covenant Life Church. Last Thursday, we launched our new website; on Friday, at the monthly One Meeting for singles, we were Undone, like Isaiah in God's temple; and Sunday we learned how to not waste our humor. Fairly soon, God-willing, I'll post on the website launch. It's been a lot of work, but I believe the additional online sermons are going to be a blessing to the church and to others outside Covenant Life. We already have reports of people downloading entire series of messages at a time. For now, I'll just mention the most exciting aspect of the new resource library to me: near-immediate posting. For the major church events, you will now see sermons in the resource library almost immediately after the meeting ends. The One Meeting was available as of midnight on Friday and the Sunday sermon was available at 4:05pm on Sunday afternoon. Say good-bye to waiting until Tuesday for sermons from that last weekend! If you missed the sermon this weekend, you can listen to it here. Honestly, I have zero notes whatsoever about sound for the services. Silence is approval in this case. Many thanks to Mitch and his crew for helping this Sunday go off without a hitch. One thing I'll mention is that I like the five-vocal ensemble sound that Mike and his band are creating with Ken's help. Would you agree? I loved the look of the backdrop this weekend. We changed the style and color of the fabric of the panels right behind the preacher, and we lowered the light level on everything except the artwork to 35%. It looked great. Craig, which backdrop lights did you gel and what colors? One note for all lighting operators from the worship team: we will be placing vocalists much closer to the front edge of the stage in the near future. As we encourage them to engage with the congregation and be more expressive (aka move around), we'll need to make sure that the lighting areas fill downstage more than we have in the past. The video was really smooth this weekend. There were a couple transitions that could have been improved, but I heard Ed and Matt discussing them immediately after they happened. Thanks, guys, for grabbing each opportunity to improve. You did a great job. This feels like a short post. That must mean it was a smooth Sunday. What did I miss? Please post your thoughts and comments here. Since I'm in the mood for posting links, Daniel Darnell of Collide Magazine has posted 10 worship service faux pas, which are worth considering. There are five here and five there. I know that we've been guilty of 2, 5, 6, 7, 8 and 10 at Covenant Life. What do you think of this list? Because I was on vacation for these last couple weeks, I won't be posting an official Reverb review of the last two Sundays. 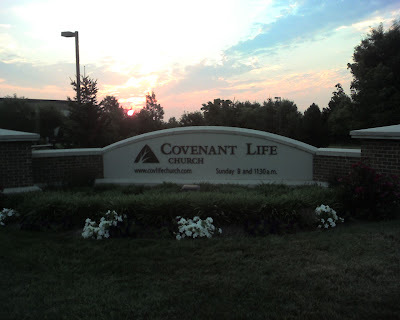 I do want to mark an historic moment, though: On July 6th, for the first time since I became Covenant Life Technical Director, I attended Covenant Life as a regular participant. I came in with my family, took my kids to their Discovery Land classrooms, sang without knowing the songlist, listened to the sermon, picked up my kids, and fellowshipped with friends. And I did all that without any specific responsibilities or even a radio earpiece in my ear "just in case." I want to take a moment to thank my Assistant Tech Director, Ben, for his many hours of effort over the last couple weeks. His work allowed me to be leave without the usual extra days of pre-vacation buildup, and he offered me an extra day off on this last Sunday. What a blessing for me and for my family. Thanks, Ben. CJ Mahaney posts about Al Mohler's thoughts on the Gospel and Art. Mike discusses what he learned about "How to Keep Volunteers" (pt1, pt2) at the Willow Arts Conference. Ryan gives some good instructions on what a music team should do when the song lyrics aren't right. It's a great example of the significant role of lyrics operators in music leadership.